The Maker Mentality: The Maker Mentality Is Out! Makerspaces are spreading across the country, but administrators and teachers are having a difficult time finding ways to integrate them into their learning environments. The Maker Mentality is the perfect book for any educator looking to take making and makerspaces to the next level. The Maker Mentality Is Out! "Nick writes a book that is not only practical and has tons of ideas you can implement in your classrooms, but he does it in a fun way that makes this book far different from the traditional education book, with funny and inspiring stories throughout the text." "The single most important aspect of The Maker Mentality for me is learning fearlessness. Not irresponsible fearlessness, but fearlessness with humility. You become fearless about failing, fearless about admitting you don't know something, fearless about trying something new, fearless about combining ideas or materials that have never been combined before, fearless about sharing, fearless about making. All the most exciting things I have learned have come from embracing my fearlessness and I believe we can do great things if we empower our kids to be fearless. " "Nicholas has done it again! He has written another funny, engaging, and practical book that is perfect for all educators looking to improve their learning environment for students and staff. Filled with pop culture and personal stories, The Maker Mentality is the perfect book to explore what it means to be a school dedicated to the Maker ideal." "As Makerspaces continue to invade learning spaces it will be important to understand their purpose, their limitations and all that is possible. Nicholas is a leading expert in helping all educators understand why having a “Maker Mentality” is more than just allowing students to use 3D Printers or learn coding. It’s a mentality that needs to be fostered in every student (and adult) so that they understand where true innovation comes from. 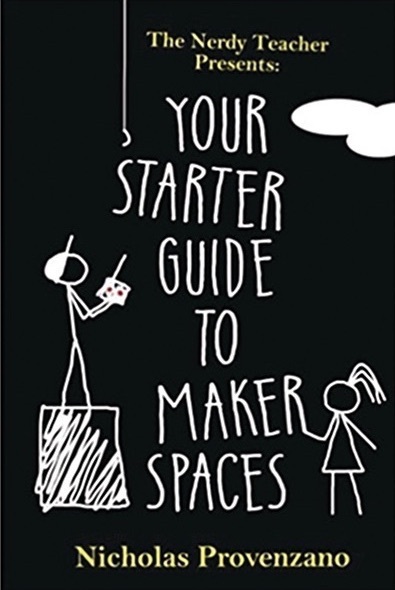 This book isn’t just for those exploring Makerspaces. It’s for every educator and leader." "Nerdtastic! This is a wonderful and practical exploration of how to become and to help foster the mentality of Making! Nicholas Provenzano has taken his expertise on the topic, experience as a classroom teacher, and truly rich and quirky sense of humor and love of pop-culture to craft a book that is perfect to the beginner and those who might not yet believe that they can. It is fun, full of great ideas, and all-around great! Now you know - and knowing (er - Making) is half the battle." "Knowing the energy and effort that Nicholas has put into this book, I am confident that any level of Makerspace explorer will benefit from his guidance and support. Knowing that he is actually DOING the work allows me as an administrator to share his resource and feel like my team will be able to hit the ground running. That's a gold mine as a principal!" "The Maker Mentality is about more than just makerspaces. It is a culture, a concept that is made up of qualities that you will want to cultivate in your teaching practice, whether or not you have a makerspace in your school. This book is full of great advice for ALL teachers and administrators. It includes enough witty pop culture references to keep you entertained throughout." "The Maker Mentality is real. In addition to being chalk full of ideas and support for makerspaces in schools, it addresses the very real obstacles educators face head on. Acknowledging that this shift in learning is not easy, Provenzano drives home the “why” and gives practical strategies for adopting the “maker mentality” systemically." "Inspiring and motivating! Nicholas empowers ALL teachers to activate and harness their inner artist to model the maker mentality inside all of us." "This book opens up the education world to dreaming to create your future. Anything can happen when you let your students explore. Like any episode of the A-Team, give the students materials and let them explore. This book will guide you through the process of becoming a maker and developing the mentality to push your student like a Sith Lord pushes their apprentice."